January 2012 we acquired a Parachute for the Streetbike. We will be the first Land Speed Bike to utilize a parachute. The chute was manufactured by Stroud Safety and installed by Sam Wills Racing Innovations both located in Oklahoma City. May 12, 2012, we took top honor as Fastest Motorcycle at the first Houston Half Mile recording a top speed of 209.1 MPH in the Half Mile. In 2011 at Bonneville Speed Week Billy piloted the Gruene Harley Davidson Entry for the Modified Production Gas 3000 cc Class open record. He recorded a 170 qualifying run and backed it up with a 172 MPH run, however these new record runs were denied due to a Production Class rule interpretation by the SCTA Officials. October of 2011 Team FKAWI teamed up with Bill Warner and Wild Bros Racing. 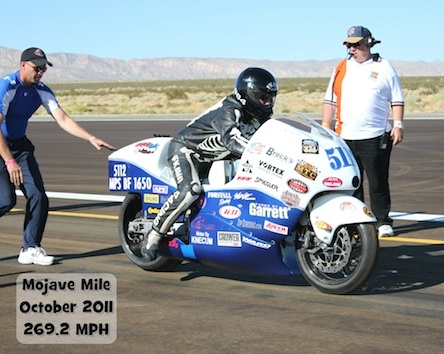 Billy became the 2nd Fastest Motorcycle Motorcycle racer in the World at the Mojave Mile in October 9, 2012 at 269.2 MPH. We acquired the Bill Warner designed and built Turbo Charged Hayabusa Streetbike just prior to the event. Bill Warner is Fastest in the World at 311 MPH. Two weeks later in October 23, 2011 we also set the New Track Record at the Texas Mile at 255.7 MPH. In 2010, we set a new world record at the Bonneville Salt Flats in the Modified Blown Fuel 1350 cc Class (Naked Class: no streamlining, fairings, or windshield allowed) The old record was 209.6 MPH. Our new record is 212.2 MPH. In 2009, we set a new world at Bonneville Speed Week in the Modified Pushrod Fuel 2000 cc Class. The old record was 168 MPH. Our new record is 170.3 MPH. Come see us race in 2012 and dont forget to stop by and join us in the pits for some fun!